James Washington Blevans and family were early residents of Bronaugh. James was born June 16, 1848 and was a son of Jonathan amd Julia Blevans. The 1870 census listed the family in Cass County, MO, near Pleasant Hill. Not long after that, James must have left for Vernon County. On January 19, 1871, James married Sarah Jane Skaggs in Vernon County. She was a daughter of James and Nancy Skaggs from the area that became Bronaugh. The 1880 census listed James and Sarah living in Harrison Township, Vernon County, along with two children, Nancy, age 9; and Ernest, age 2. By 1886, the new town of Bronaugh was being built since there was a need for a railroad town in that location. One of the first buildings constructed was a hotel. Early newspapers tell that "Mr. Blevans" was the builder and it was soon called the Hotel Blevans, so one can probably assume that this refers to J. W. Blevans. The Blevans family must have lived just northwest of Bronaugh. They were listed as members of the Mounds Methodist Church which was located about a mile north of town (before the town was founded). Later, they were enumerated among the families near Inglish School. Nannie (Nancy) A Blevans was married to Charles E Steinbach on 22 Feb 1899 in Nevada, Missouri. The 1900 census showed James and Sarah still living in Harrison Township. Living with them were son Omer E. (Ernest), born February 1878; and Lena L., born September 1886. Note - the name Lena is from the census, but she also was referred to as Dona. It appears that James taught at Ragtown School in 1903. He did not finish the school year because he had gone to the state capital where he had been employed as a clerk in the state legislature. The 1910 census listed the family as residents of Copan, Washington County, Oklahoma, inferring that they had gone there during the great Land Run. The listing showed James, age 61; Sarah J, age 60; and daughter, Dona, age 28. Records from Cooper College, in Moundville, MO, show that Dona had been a student there in 1903. It should be noted that son Ernest Blevans was also living near Copan in the 1910 census. He had married Nora (Nona) Morren of Bronaugh, daughter of the marshall Billy Morren. 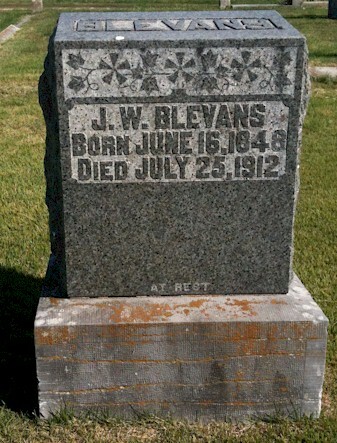 J. W. Blevans died in Oklahoma on July 25, 1912. His remains were brought to Worsley Cemetery for burial. The area where Sarah's information would have been listed remains blank. She remained in Oklahoma and she died in 1932 and was buried in Ridgelawn Cemetery at Collinsville, Tulsa, OK.